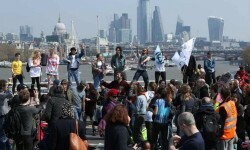 Tuesday - Thousands of people have blocked well-known landmarks and a bridge in central London, bringing widespread disruption to the capital in a “climate rebellion” that organisers say could last several days. Tuesday - Two British companies are joining forces to establish a plant which will turn plastic waste into hydrogen. 5 Apr 19 - The charity running the Edinburgh international science festival is to ban sponsorship from oil companies including Shell and Total after protests by climate campaigners. 28 Mar 19 - The mail must get through ... and now it's the job of e-trikes to deliver letters and parcels. 25 Mar 19 - Local councillors in Cumbria have voted unanimously to approve a new deep coal mine, Britain’s first in three decades. 25 Mar 19 - The BBC has just announced that David Attenborough, 92, will present a 60-minute film, Climate Change - The Facts, which will be screened this northen spring. 20 Mar 19 - A veteran UK weatherman has called on the BBC and other major broadcasters to radically overhaul their forecasts to incorporate information about climate change. 15 Mar 19 - The UK Government has announced plans to end fossil fuel heating systems in new houses from 2025. 11 Mar 19 - The UK Government has announced an offshore wind generation deal which could triple the number of green-collar jobs by 2030. 6 Mar 19 - New analysis shows UK carbon emissions have fallen for the sixth consecutive year. 26 Feb 19 - Ban Ki-moon has urged Britain to stop funding fossil fuel projects overseas, in what he said would mark a test of Theresa May’s commitment to act on climate change. 22 Feb 19 - Teachers will follow on the heels of striking UK students tomorrow with a protestto demand the national curriculum be reformed to make the climate and ecological crisis an educational priority. 20 Feb 19 - Britain is about to set out plans to overhaul its recycling system, including making plastic packaging producers pay the full cost of dealing with their waste. 19 Dec 18 - A pressure group has called on the BBC, as Britain's public broadcaster, to convey the severity of the climate and ecological emergency. 17 Dec 18 - London mayor Sadiq Khan has outlined his new climate change plan, designed to protect people from floods, fires and political upheaval. 27 Nov 18 - Ten years after its creation, the landmark UK climate change legislation has many lessons for other countries as they look for ways to turn the Paris deal into national action. 23 Nov 18 - Millions of gas boilers will need to be replaced with hydrogen alternatives and coupled with electric heating devices if Britain is to hit its carbon targets at the lowest cost. 16 Nov 18 - People in the UK who waste heat by failing to ensure their homes, offices and factories are leak-proof will soon have the prospect of a spy in the sky to persuade them to mend their ways.